Who doesn’t like purple food? Well for one, Nicole won’t like this post since she hates beets with a passion. Thinks they taste like dirt. Me, I love ’em. I’m pretty sure I ate dirt as a kid, and let me tell you beets taste nothing like it. This snack started out as a cool idea to make something geometric for photography class. Ultimately, things just looked so much better in my head and I wound up not submitting it. Sigh. The beets needed to be cut with more precision, there should have been less balsamic syrup, a little more depth-of-field, etc., etc. Maybe next week. The good news for me was that it still tasted pretty damn good, and there are enough intriguing aspects to the picture for me to land a spot on TJCC. Good thing I have some pull around here. I am including the recipe, but realistically it’s not much more than what the title of the post says. As I am typing this I am thinking a little black pepper would look and taste nice. Make sure to wear a full body protective suit to prevent staining your clothes. As an alternative, you can cook this naked. I’ll let you use your imagination as to how I made it but needless to say, it won’t be an episode. Reduce vinegar in a really small pan, watching carefully as it gets really thick and can burn easily. Add water if it gets too thick before you drizzle. When beets are ready, peel and cut into an interesting shape. Perfect cubes are hard to make without a protractor and miter box. Crumble cheese over the top. You can throw the whole thing under the broiler for a smidge to crisp up the cheese, but this is overkill. Drizzle balsamic glaze and throw on some herbs for kicks. Hide from Nicole and eat. I love beets. No one else in my house can stand them. I look at it positively though- I never have to share them. Hey Roz, glad you stopped by — the beets were so easy to do its criminal I don’t make this more often. You can subscribe by clicking on the little orange square close to the top right. This should allow you to subscribe via an RSS reader. Also, at the bottom is an item called ‘RSS’ which will allow you to do the same thing. I agree with the Shiksa Nicole too, beets DO taste like dirt. However, when I started to get my CSA and got them farm fresh and then roasted them, they were sooo sweeeeet! Now I try to roast them to make them caramelize. I love that you posted this because guess what? I got beets in my veggie box and have some feta and was thinking of doing the roasted beet and feta salad again tomorrow! I love your photos, you are doing a great job. The fact that I don’t have the patience to take good photos of the food I make (when we are hungry for dinner) is the main reason we post mediocre photos, we are impatient! Getting the beets to be that square would madden me! When I cater I find it difficult to be one of those precision kind of caterers! How did you do it so perfectly? Great post, Andy! Maybe your comment will help convince Nik to try beets again…it will take a little bit of work though. BTW — I popped by your site, and the recipe for the piripiri chicken sandwich sounds really interesting. I haven’t had piripiri since I vacationed in Portugal many years ago! This photos is stunning! I am speechless. How did you get such a good geometric square? Your photos are really nice. I know beets or a love em or hate em vegetable but, I love them. P.S. Would you reconsider using Google followers? Thanks Velva. It was really tough to grow the beet in that cube shape, but I did it! In all seriousness, I just cut off the sides and trimmed it up a bit. A little difficult consider how slippery they get, and in reality it didn’t look as good as the picture suggests. You can kind of see the little one is kind of deformed more…. Thanks for stopping by my site, your pictures here look amazing. I love the wordless Wednesday photo, but your blog takes so long to open on my MBpro that I will leave that comment here…- I cannot imagine that there was THAT much criticism over this photo. Obviously, I don’t have “the eye” and neither do most of us, thank G! Gorgeous photo and great idea. 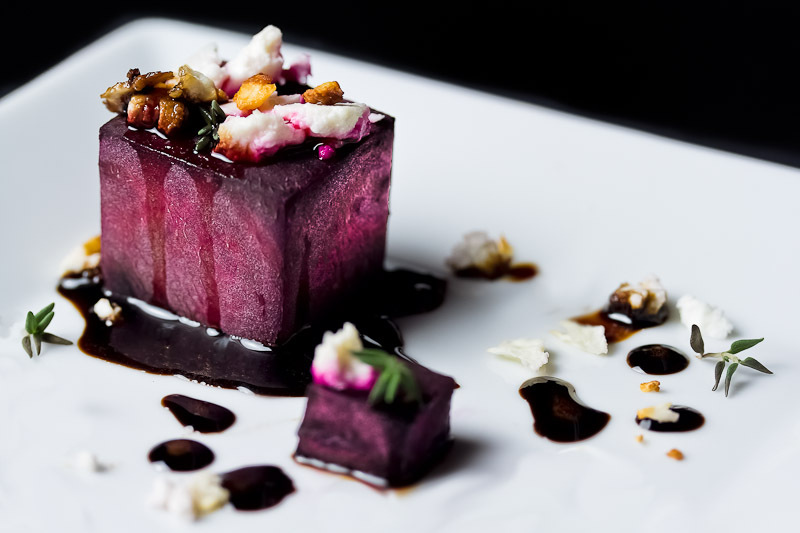 I will be posting a beet salad soon, too – have made it for a few years, but keep forgetting to post it – well, have so many backed up to work on and get out. I LOVE BEETS and they are also great with chevre. A friend served us roasted beets with a goat milk pannacota that had me in HEAVEN. I didn’t submit this pic because this version has needed some serious editting in photoshop which is a no-no for photography class. You can see my edits, as I was a little sloppy with them, and even after all the editting its still not quite the way I wanted it. All that being said, it still looks pretty good and will hopefully inspire people to “give beets a chance” (all we are saying, you know). i think that looks absolutely amazing. I love the presentation! I must convince my husband that beets are amazing… I have tried for a long time but maybe if I show him this picture he might change his mind… it looks like dessert! @Nutpi, its a tough road trying to convince your other half to “give beets a chance”. Nicole wouldn’t try it, even as beautiful as it came out. With the super sweet and sticky balsamic glaze, it almost tastes like a dessert too. Let me know how you succeed.